Light and dark combination Parker Brown fancy paint cow. She's a sweetheart! Pi is a flashy thick bodied cow with an extraordinarily calm demeanor. 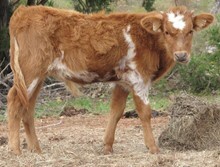 She has a pedigree that we love and a conformation that will go a mile! Great producer and passes her disposition along!